The combined scent of insect repellent, sun screen and munitions is especially aromatic at 12:30 in the morning. There I stood – a place where minutes earlier thousands had observed bright lights ruling the skies synchronized to modern melodies and broadcast throughout our fair city during an event called Celebrate Freedom – a community outreach sponsored by Harvest Church. The hanging smoke left an eerie scene as the portable light poles broadcast luminance throughout the breadth of the park. Fast forward a few hours of abhorrent sleep and now I’m back at the park; full day-light and ready to put this event to rest. Gathered with a handful of post-event volunteers, we set out with trash bags to pick up the remains left by the crowd the day before. I wondered what was going through the mind of the metal detector jockey watching me gather scattered debris as I watched her intently searching for anything as slight as a coin bearing the image of Abraham Lincoln. Take a long look at this picture. Imagine, if you can, how this water bottle was forced into this shape. Imagine the energy it took to manipulate the molecules in this plastic for it to remain in this condition long after the handler’s will was exacted upon it. Now, imagine where I found this bottle; thoughtlessly discarded thirty-feet from a red recycle bin and forty-feet from a faithful black trash can. All this trash picking has left me thinking about the human condition. Why do people litter? Are people really that lazy? Is it accidental? Or do they just not care? 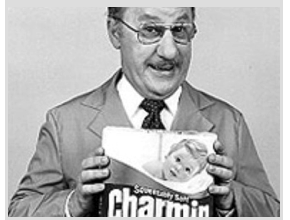 My friend Duffy offers the infractors the benefit of thinking it’s mostly accidental. 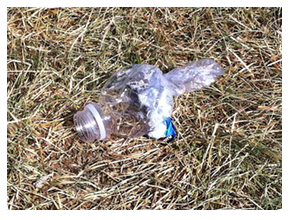 Maybe; because 94% of people polled think that littering is an important environmental issue. We live in a plastic convenience culture; virtually every human being on this planet uses plastic materials directly and indirectly every single day. Our children begin life on earth by using some 210 milion pounds of plastic diaper liners each year. We give them plastic milk bottles, plastic toys, and buy their food in plastic jars, paying with plastic credit/debit cards. Every year we eat and drink from some thirty-four billion newly manufactured bottles and containers. We patronize fast food restaurants and buy products that consume another fourteen billion pounds of plastic. In total, our Nation produces an estimated sixty billion tons of plastic material every year. Each of us, on average, uses 190 pounds of plastic annually: bottled water, fast food packaging, furniture, syringes, computers and CD’s, DVD’s, packing materials, garbage bags and so much more. When you consider that this plastic does not biodegrade and remains in our ecosystems permanently, we are looking at an incredibly high volume of accumulated plastic trash that has been building up since the 1950’s. The truth is, we all know about the problem. Now its time to act on it. But if you already do have proper and responsible waste disposal habits, remember that you can make a difference by encouraging others to follow your example. When we dispose of our garbage properly, instead of polluting our environment, it does more than just help keep our locale neat and tidy – it makes you feel like you’re making a difference. “Yes, I mind” was his quick reply. However dissatisfied with his answer, I compliantly said, “ok”. I quickly snapped one shot trying to balance unfavorable luminance with Richard’s seeming crepuscular demeanor. I put out my hand and while Richard reciprocated, I thanked him. I mentioned living in Montana and being down at Moss Landing for Thanksgiving with my sister, a resident of California. “You mean, Kalispell?”, I offered. Kalispell is in the northwest corner of Montana and a several hour drive from where I lay my head most nights. It’s located seven miles from Flathead Lake and 31 miles from of Glacier National Park. It’s a place known for ice-carved mountains and inviting beauty. It’s uncertain who was more stunned by my allegation. I expected Richard to disregard my personal history lesson by getting back to his fishing tackle or worse, by throwing a hay-maker my way. Yet, instead of enmity, Richard starred at me; obviously taken to a place 1200 miles north of our position. He was engaged. 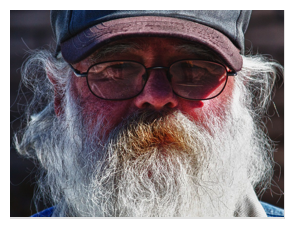 As he sat on the tailgate jutting out from the rear of his rust-bucket, I told him my story. It’s a story that concludes with God, my heavenly Father, filling the void left by my earthly father. It’s a story that illustrates God’s plan for my life through a relationship with Jesus Christ, my sin bearer. It’s a story that offers forgiveness, understanding and hope for a better tomorrow. It’s a beautiful story. Our conversation ended two hours later with me inviting him to eat Thanksgiving dinner with my family. His reaction confirmed he wouldn’t show. He’s a loner who allowed me a rare opportunity to invade his isolation for just a couple of hours. I encouraged him to call his son and to get reacquainted. For Richard’s and his son’s sake, I hope he does. Actually, all I could do is stare; mouth wide open getting angrier by the moment. At a distance, the lonely seal just looked out of place, separated from the community almost as if it was ostracized. A withdrawn seal among a community of seals – and I mean a community! They were laying all over each other, busy and active, barking and jawing each other. But not this one. This one was different. This one was detached. This one was declining. I recently got home from spending a week at Moss Landing over the Thanksgiving holiday. Moss Landing is a small beach community about 10 miles north of Monterey on the central coast of California. It’s a striking place with rocky waterfronts, coarse, sandy shores and thousands of barking sea lions. It was Thanksgiving day. My sister was busily preparing a wonderful feast complete with roasted turkey, wild rice and mashed potatoes. While she was crashing pots and pans in the kitchen, I wanted to witness crashing waves. I knew there was a dock full of sea lions about a mile away, near Elkhorn Slough, so Selena and I headed there lugging our cameras. We gingerly strolled up the pavement barely able to hear each other talk because of the noise and breeze produced by dozens of passing vehicles annoyingly hugging the shoulder. About the time you get to the bridge spanning the Slough is the about the time you start hearing barking seals. Halfway across the overpass you begin seeing literally hundreds of seals bathing in the sun. We quickly made our way to the jagged shoreline taking dozens of pictures of these extremely social mammals. It was fun to watch them interact with each other. They were spry, energetic and playful. I wondered for a moment what an existence would be like with not much to care about other than when the next meal would be brought in by the tide. The next moment was spent observing the scars left from close encounters with propellers resident on many of their backs and sides. It was while I was agonizing over their disfigurement that I noticed one disunited, motionless seal fixed on the very edge of the dock. I had to get a closer look. 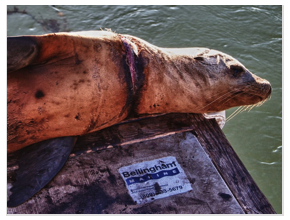 Aided by my new vantage point, I could see the problem; a wrapped fishing line had caused a one and a half inch laceration around the seals neck. It was dying; all because of the carelessness of a fisherman too preoccupied to care about the peril his monofilament, with a tensile strength greater than steel, would cause. My stomach turned as my spirit burned. Honestly, I cannot find the words to describe how angry I was at that moment. As I was fantasizing about the slow, painful death of the careless fisherman with my steal-like hands wrapped around his neck, I was struck with a two by four of reality. I’m no better, except my carelessness doesn’t include fishing line. My imprint on the environment doesn’t look like a scar on the back of some seal in central California. My signature is left on nature every time I don’t turn the water off while I’m brushing my teeth or drinking coffee from a paper cup all because it’s more convenient than a washable mug. Every time I lazily leave lights on I’m wasting the resources of my world. Today, I’m more “green” than I’ve ever been. I’m changing my life. I’m respecting the world that God created more today than I did before this painful experience. I’m shutting the water off when I brush my teeth. I’m turning lights off. I’m using a washable, ceramic mug to drink my coffee around my office. My footprint will be smaller now because of the careless death of a California Sea Lion. Will you join me? Click here to see pictures of more seals and surroundings of Moss Landing. How often do we find ourselves prompting our children to say, “thank you”? Whenever they’re offered a treat from a friend or someone helps them out we find ourselves asking, “Now, what do you say?” We want our children to be respectful and use good manners, which is why we teach them to say, “thank you”. It’s funny that we need to be taught to say something so simple. 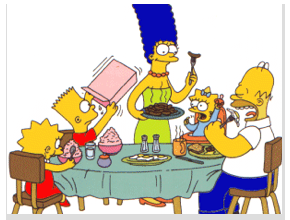 On November 1st, 1990 Fox aired an episode of the The Simpson’s depicting the family sitting down for a meal. Before they ate, Homer asks Bart to give thanks. Here is what Bart prays, “Dear God, we paid for all this stuff ourselves, so thanks for nothing.” Undoubtedly, the producers of the show intended Bart’s prayer to be amusing. However, I don’t think they knew they were touching on the dark side of prosperity. After the Exodus from Egypt, God instructed the nation of Israel that He would be leading them to the land already prepared for their habitation. It would be a land flowing with milk and honey; a land filled with vineyards and olive groves that others had planted. But God warned them that with prosperity would come the danger of forgetting God. They would be tempted to look around at their wealth and take credit for what God had given them. It happened. The same mentality exists today. We relish unprecedented wealth and yet we fail to recognize that its source is God. Why? The short answer is sin. We take our wealth for granted. We feel we deserve it. We imagine that we created it. We are guilty of the very thing God warned the Israelites of. We have developed an attitude of ingratitude. Although prosperity is a blessing from God, it can have a chilling effect on our love for Him and on our gratitude for His blessings. What is the remedy? Should we give everything we own away and take a vow of poverty? That might work temporarily but it does nothing at the heart level. Here are four observances I have been weaving into the fabric of my life as I have been converging on the fourth Thursday of November: 1) Thankful people focus on what they have – not what they don’t have. 2) Thankful people admit they have more than they deserve. 3) Thankful people know that thankfulness needs to be developed. And, 4) Thankful people gauge blessings by things other than money. It’s vitally important to be thankful – not just one day a year, but every day because it needs to be the pattern of our lives. To borrow a seemingly trite question, what are you thankful for? A desire for freedom…it’s what causes every eighteen year old, who checked out at age sixteen, to get their own palace after graduation. A desire for freedom is at the core of independence. That whole scene got me thinking about freedom. Let’s define the term from Webster’s Dictionary. Freedom: the state of being free or at liberty rather than in confinement or under restraint. Since the debacle in the Garden every person, society, and culture has been pursuing freedom. But, freedom from what? “Now you can truly connect anywhere! Keep in touch with the world below, even as you fly high above it. Easy Wi-Fi connectivity keeps you close to what matters. 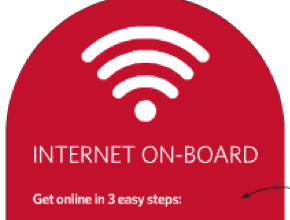 Get online in 3 easy steps…” This was the heading and compelling statement on the card the airline dude handed me as I stepped onto the Boeing 757 bound for Minneapolis from Detroit. I was tempted by the cards promise to keep me connected but for $9.95 I decided it wasn’t worth it. I was planning on using my Mac to catch up on some computing tasks during the two hour flight, but connection to the WorldWideWeb wasn’t necessary. What’s funny about all this is that I’m as close to what matters as I want to be; assuming that ‘what matters’ is my relationship with God. At any given moment I’m connected to Him through prayer. During a recent meeting, I was watching a bird perched on a tree branch through a nearby window. It was there the entire 90 minute session so I assumed it was sleeping. Have you ever watched a bird sleeping on its perch and never fall off? How does it manage to do this? The secret is the tendons in the bird’s legs. They are so designed that when the leg is bent at the knee, the claws contract and grip like a vice. The claws refuse to let go until the knees are unbent again. Interesting that a bent knee provides so much support for a bird don’t you think? 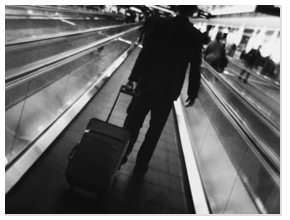 All this leads to me a question: Do I have a habit of regular prayer – knee bending prayer? Do you? I am not asking if our prayers are perfect or if we’re negligent at times. But is prayer a habit? Here’s a quick list of habits you might have: Sleeping, eating, exercising, recreating, going to work, going to school, taking a shower, shaving, spending time with friends… But what about prayer? Do you have regular habit of spending time with God during prayer? If not, are you ready to start? If you are not sure how to pray, don’t despair! Prayer is simply having a conversation with God just like you would have a conversation with anyone. It’s great to have conversations with the Creator of the universe and make requests of Him but it’s also great to take time to listen. Just like being connected to the internet provides upload and download capabilities for your computer or other type of device, prayer allows us to upload (pray for requests) and download (listening to what He would say to us) in our relationship with God. And, the best part is you don’t need $9.95 to get connected – you just need a moment.